Below are some details and information with respect to the events on 22nd & 29th April. Please make sure to read them all the way through the end. Please report at the front desk 30 minutes prior for all the events. We are on a very tight schedule and will be starting all the events ON TIME as soon as 5 participants report at the front desk to honor everybody’s time including the judges. * Events scheduled at the same time will not overlap for the same Group. 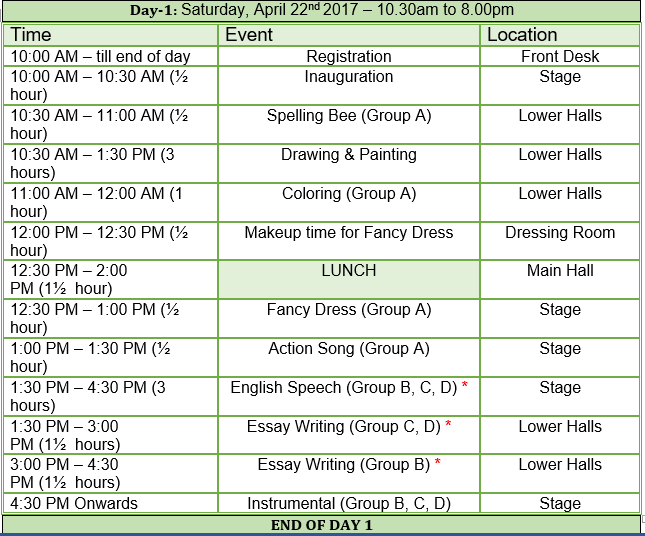 This is a tentative schedule and is subject to change based on the final count of participants registered or in the event of any unplanned circumstances. Please arrive at the venue at least 30 minutes before your event to complete registration formalities. Participants are requested to report to the program coordinators 30 minutes before the start of the respective events. The registration fee will be collected at the front desk after which each participant will be given a PARTICIPANT BADGE (unique ID) for the day. All Members need to renew their membership at the time of the event – $10/Family or $5/Person. 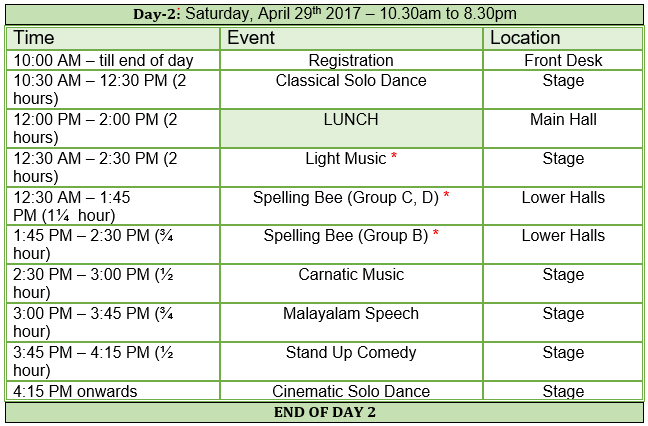 Please email to varnolsavam@mnmalayalee.org the dance music files no later than 04/21/2017. The file has to be .mp3 format and please add the event name, participant’s name and song name to the file so we can identify them. Varnolsavam is being conducted at St,. Marys Catholic Church (St. Paul). 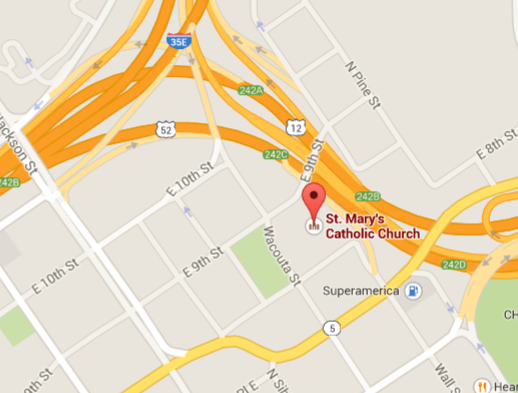 The church is at the intersection of 8th St. (E) and Wacouta St. The church has a parking lot with sufficient parking spots. Please enter the venue through the entrance door from the parking lot side. Do not use the main entrance to the church. Food, snacks and beverages will be available for purchase. Participants will receive FREE LUNCH. Please make sure to collect the ‘Participant Food Coupon’ from front desk. If you have wanted to volunteer with us, there are some great opportunities. To volunteer or for more information, please email us your details. Goodluck to all the participants!